Nathan Outteridge wins the lot with a race to spare. 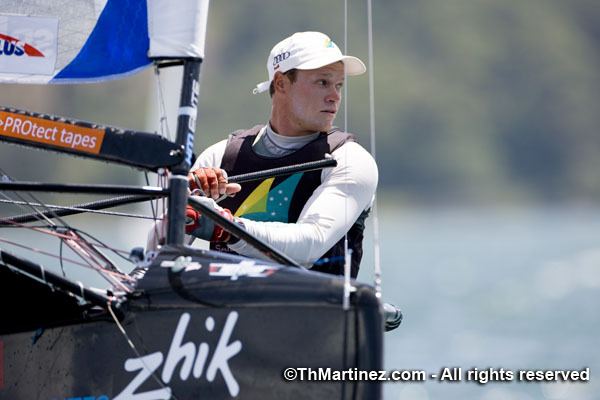 Home, SWEET SWEET, home for Nathan Outteridge (AUS) who wins the 2011 Zhik Moth World Championships after dropping a 6th place finish in Race 8 for a total of 23 points in the series. Parents and friends in ribs are cheering, Australian flags out flapping. Not a bad summer at home, after he won the 49er national title and was crowned national champion in the Moth all here on Lake Macquarie. Kiwi Peter Burling flyin' high. 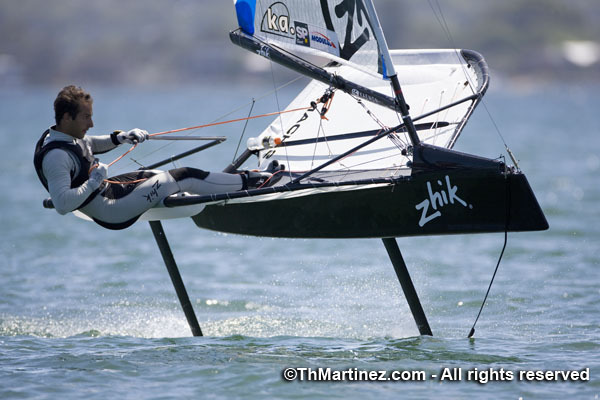 Zhik releases new sailing shoes in honour of the 2011 Zhik Moth World Championship. 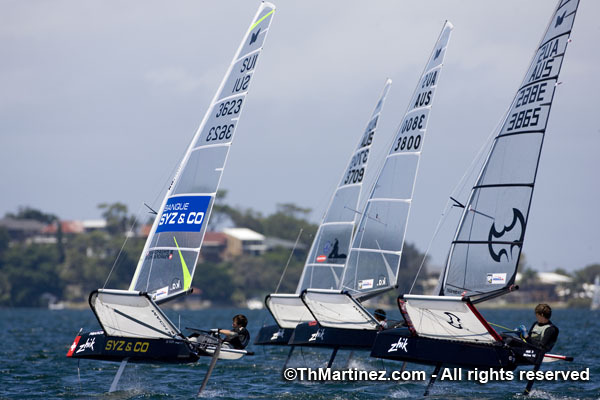 Tom Slingsby (AUS) Heats it up in Race 4, before dismasting in Race 5. The game has decidedly turned going into Race 5 of the Final Series at the 2011 Zhik Moth World Championships. Racers are still flying fast, but the tactical gears are beginning to churn. In Race 5, Peter Burling (NZL) lead around the course, ultimately losing to Iain Jensen (AUS) on the last leg. Nathan Outteridge (AUS) now with 8 points was back in form after the injury, lost out on the win, but played a tight race against the leading contenders, Joe Turner (AUS) and John Harris (AUS) who have 19 and 23, respectively. Turner finished the day strong, but he does carry a DNF into the final day of racing and cannot afford any slip-ups. Emma Aspington (SWE) hiking hard. Outteridge goes into the final day with a comfortable 11-point lead (although what’s considered “comfortable” in a Moth Fleet is debatable.) Second place on down is anybody’s guess. Even with Bora Gulari’s (USA) OCS in the final race, he was able to climb back to 13th, which is currently his drop for a score just 7 points back from Turner. Scott Babbage (AUS) sits just ahead, and despite having a double-digit race early in the day (10th), he did hit a 31.1 knot split during the racing. Forecast reads for 20 knots 9300hrs, and PRO Peter Moor has moved the start of Silver fleet to 1000hrs AEDST, with Gold to immediately follow. 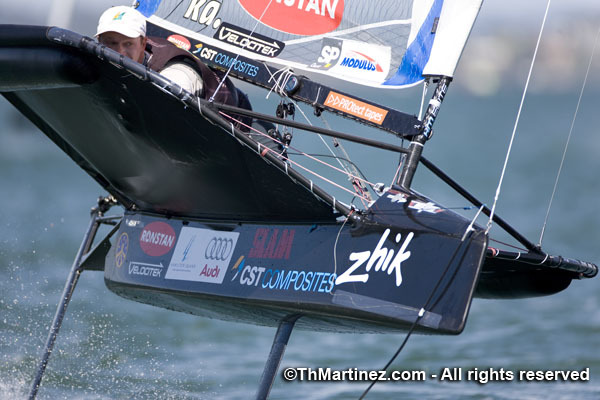 Josh McKnight (AUS) in a standout 5th place finish in Race 4. Outteridge presses the "Eject Button". It’s the battle of the breeze as the steady 24 knot East-Northeasterly tore down the racecourse, with max gusts recorded during the first (and only race so far) at 27 knots. With Silver Fleet postponed on shore, Gold Fleet danced the “You Launch First, Mate” before the daunting trek to the start line. “It’s like the Gorge [2009 Moth Worlds],” said Lindsay Bergan, “I leave just enough time for 1 wipeout on the way to the start line.” Her teammates agreed – you don’t want to be out there long than you have to. Clear start, carnage ensues. 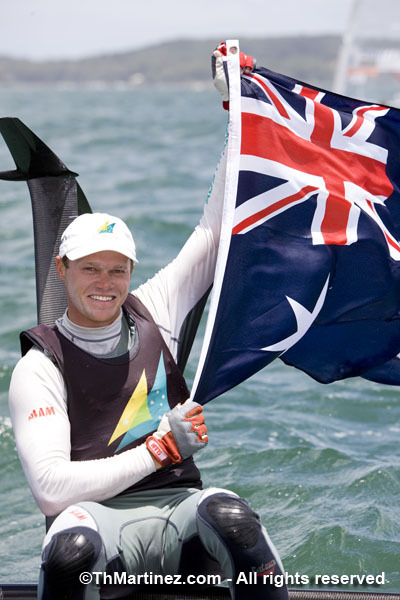 First with Moth Squaddie Joe Turner (AUS), capsizing he emerged with foils in hand. He managed to salvage all the bits and make the upwind haul back to shore. A Moth without foils? “Felt like a Sabot,” he reported. 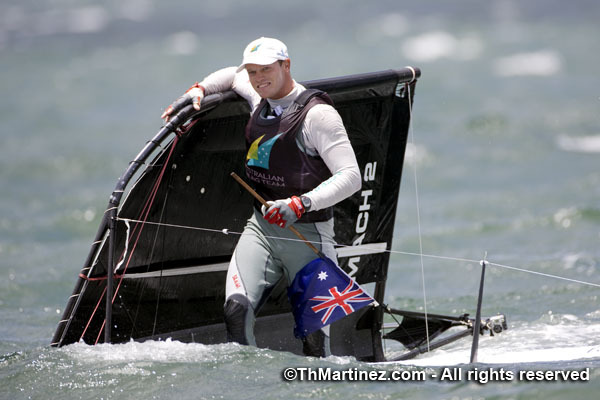 Tom Slingsby (AUS) was next. After a rocky start, he bolted up the course and assumed control after the first 3 boats sent it in at the windward mark, with Rob Gough (AUS) and Bora Gulari (USA) hot on his heals. At the leeward mark it was “Absolute carnage everywhere” according to Rescue Rib Driver John Fullerton. The full top flight stacked it – Gulari was the first to recover, and fired off lap 2 in the lead. 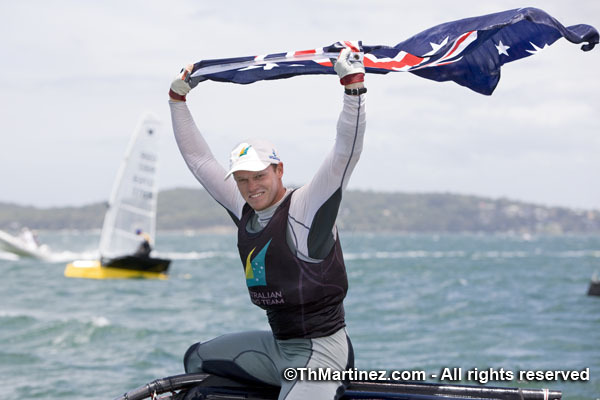 Slingsby had a tough time recovering, as did Peter Burling (NZL) and Iain Jensen (AUS). Nathan Outteridge (AUS) went over landing on his side-stay, taking a big hit to his leg and forearm. Sheer determination drove him to a 2nd place finish, and as soon as he hit shore he was on ice and analgesics. Walking on water - not easy in 25 knots. 1515hrs, 13 Jan 2011, Race Committee in sequence for Race 6. 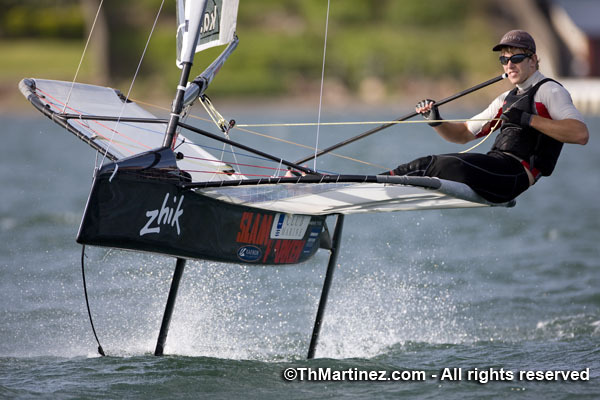 24 knot gusts pumped down the race course for a full day of racing at the 2011 Zhik Moth Worlds’ first day of the Final Series. Rarely dropping below a healthy 18 knot East by Northeasterly, sailors across the fleet had their share of stacks, crashes and comebacks that has opened up the scorecard. Outteridge was hot out the starting gate in Race 1, holding a sizable lead over a contentious 2nd place held by Brad Funk (USA) and Scott Babbage (AUS). Funk spilled, and with record speed Babbage launched ahead of Outteridge in the final lap, ultimately losing it in a bad rounding. Outteridge sailed in for the win. 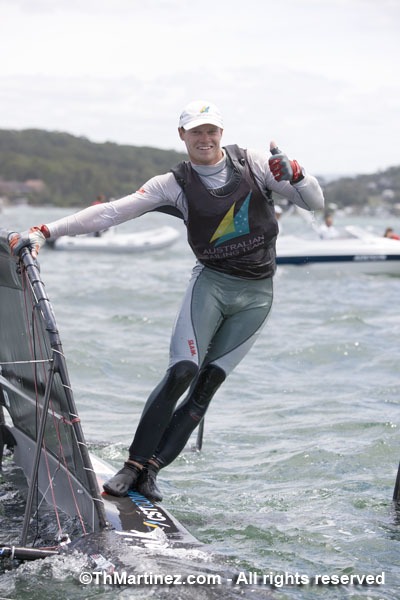 Funk and Kiwi favourite Peter Burling faced a swim-a-thon, Funk losing a Port-Starboard battle with Harris, and Burling started his swims at the gun. Joe Turner (AUS), Bora Gulari (USA) and John Harris (AUS) had serious pace around the course which they carried into Race 2. Babbage and Outteridge in a battle for speed. Gulari sizzled up the first beat of Race 2, swapped leads with Outteridge and Harris, and was ultimately edged out by both, finishing half a second behind Harris for 3rd. An unfortunate collision with another competitor sent Burling ashore with a ripped sail, while Outteridge took another bullet. Back in action for Race 3, Burling sent a message to the fleet by taking an early command that he held into the finish. Tom Slingsby (AUS) 5th at the first mark, climbed through the fleet surfacing with a 2nd, and Turner proved most consistent closing with a record of 3, 4, 3 (More consistent was Simon Payne (GBR) who had straight 22nd’s). And Outteridge? He was deep off the line, but he ripped through the fleet for a 4th. Rocketing when it works, the Wing-sail had an action packed day. The Wing-sail “piloted” by Charlie McKee lit up the first leg of the course in 7th place when it exploded at the mark – and right in front of Moth Class photographer Thierry Martinez. Pit crew and Wing-engineer Rob Patterson (CAN) pulled hero moves racing in for a rig-swap to get McKee back on the line for Race 2 without a second to spare. The ladies held it down finishing all races, with Emma Aspington (SWE) now leading the 4-point spread. 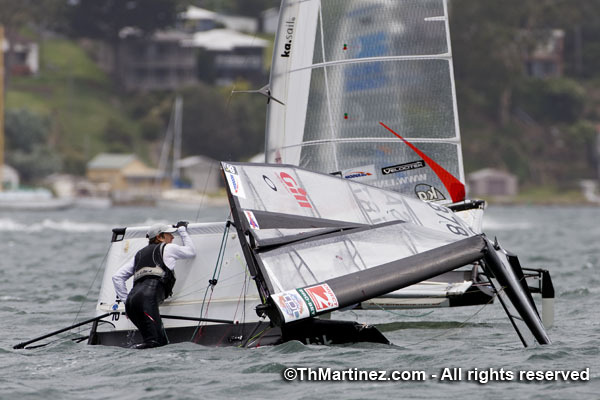 Damage took its toll on Funk and Dalton Bergan (USA), Funk lost a rudder, Bergan a rig and now carries 2 DNFs. Lochlin Byrne (AUS) leads silver, but it was standout James Phare (GBR) who won the day with a 2, 2, 1, and 15 year-old Jack Sherring finished with a 4th, now 12th overall. Racers take a lay-day tomorrow – from the racing that is. Event sponsors SP-High Modulus will be busy providing carbon for the flurry of repairs. More action to follow Thursday, with the Final Series to close on Friday the 14th of January. Breeze ON for First Day of Final Series. 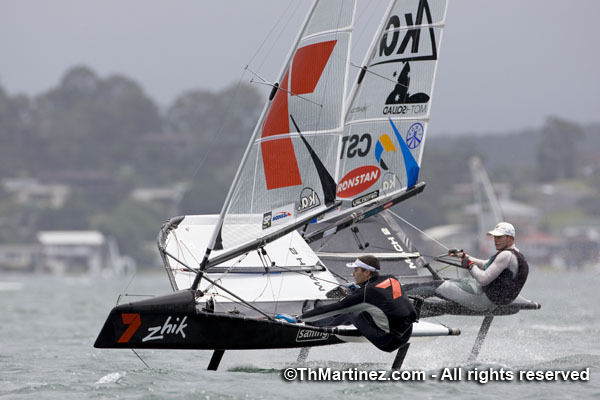 With 20 knots pumping through the harbour in Belmont on morning of Day 3 at the 2011 Zhik Moth Worlds, most of the fleet rigged their 10 m (heavy air) sail. 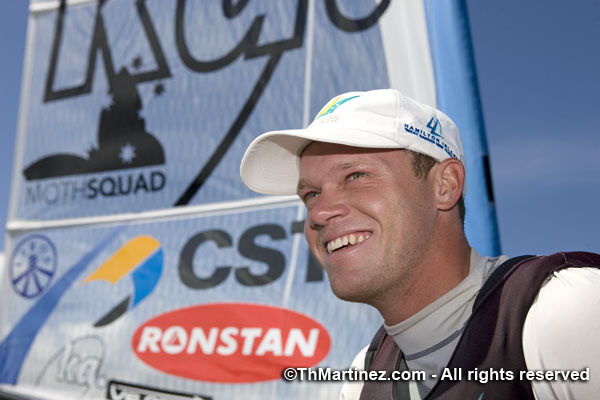 A few dared the 13 m sail, such as Nathan Outteridge, Brad Funk and Mach 2 designer Andrew McDougall. The stack-files are filling as the breeze builds. Second runner up is front-runner Kiwi Peter Burling who took two spills that cost him the chance to match his best-mate and top-rival. 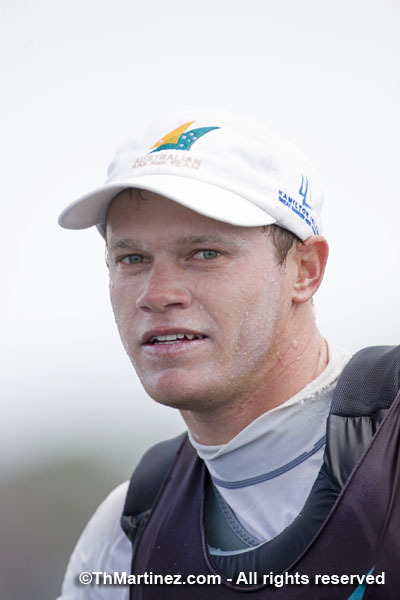 Next up is South Australian Greg Wise (100th place) when just crossing the final finish, the boat ripped out from under him and sailed on another 50m. When fished out of the water he laughed, “Well that’s never happened before!” Not a move to try back at home with all the “shark issues”. Stack of the day goes to A-Mac when he nearly plowed into the Race Committee and landed right under the lens of the onboard camera crew. Everybody loves a good wipeout, except when it’s your own: “Why are you filming this? !” he shouted while trying to fend off from potential damage. But on shore he came to his senses admitting, “It really was quite spectacular.” Congratulations to A-Mac, soon to be populating the Facebook feeds across the globe. Hiroko Goto and the 3 Golden Frogs sail into Gold Fleet. Hiroki Goto will be buying dinner tonight, for taking that final spot in Gold fleet over teammate Hiromitsu Kunimi. Tatsuya Wakinaga leads the team in 39th. Joining Kunimi to lead the silver fleet (all with 181 points for the series) are Christopher Dey (AUS) and Les Thorpe (AUS). But when the Facebook Feed reported that Burling suffered “two major wipeouts”, who liked this post? 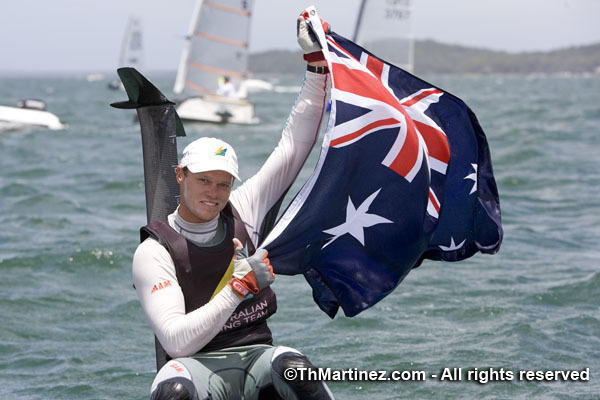 Just another day at the office for Nathan Outteridge (AUS) who flawlessly handled the gusty 16-18 knot Easterly on Lake Macquarie at the 2011 Zhik Moth Worlds during the final day of the Qualifying Series. 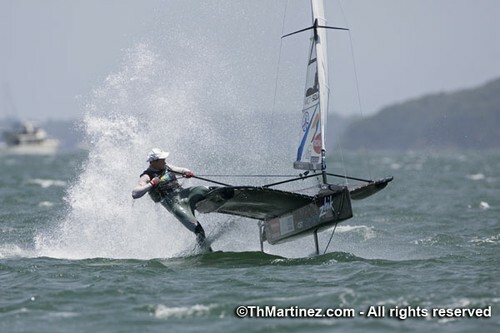 In the last start of the day he blasted off the line at 20 knots, after dipping the line from above the start boat. Also moving quickly was Kiwi Peter Burling hitting a max of 27.7 knots, but he suffered two stacks in the last race, costing him the chance for another triple bullet day and a minor injury when his foil came down on his back. Joe Turner (AUS) swooped in for the win and enters the finals in 3rd. Scott Babbage was almost too consistent, failing to cover Outteridge in the final downwind of Race 9, and earning straight 2nds for the day, putting him 4th overall. Is Bora back? “I think he might be”, reports the 2009 Moth World Champion Bora Gulari (USA), who in the first race of the day wasn’t quite on pace, but was able to turn up the heat for a 4th place finish. Closing out the day with two 2nds, he jumps to 11th place. Fellow American Brad Funk (USA), who was off to a rocky start with fleet mix-ups and an OCS, grows more consistent and holds onto his 9th place slot. Standout performances were made by Arnaud Psarofaghis (SUI), leading the Europeans, and Andrew Budgeon (GBR). 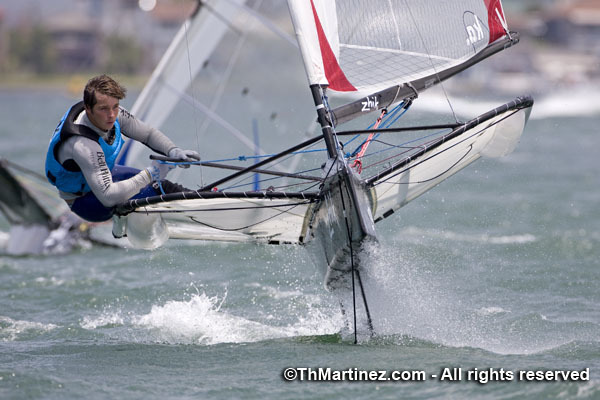 2010 Moth World Champion Simon Payne (GBR) clings to 19th with a damage-free day for Charlie McKee and the Wing-sail, now in 21st. There’s a tight battle for leading lady with Sam England (AUS), Emma Aspington (SWE), and Linsdsay Bergan (USA) all qualifying for Gold with 51, 52, and 53 points, respectively. Fortunately most the fleet survived the day unscathed, and event sponsors SP-High Modulus, who have offered free carbon for repairs during the event, can hang on to their supply for another day. 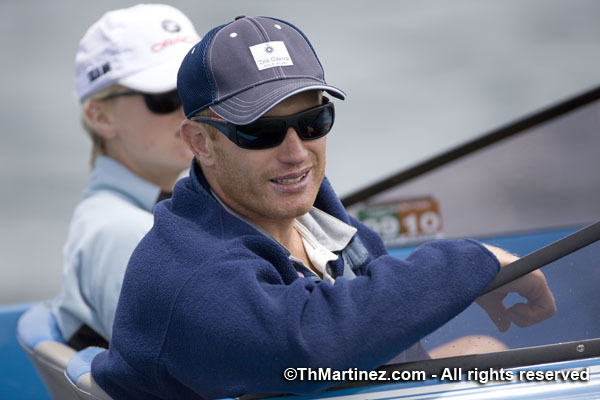 James Spithill enjoys the view. The top 55 proceed to Gold Fleet, with 54 sailors making up Silver. 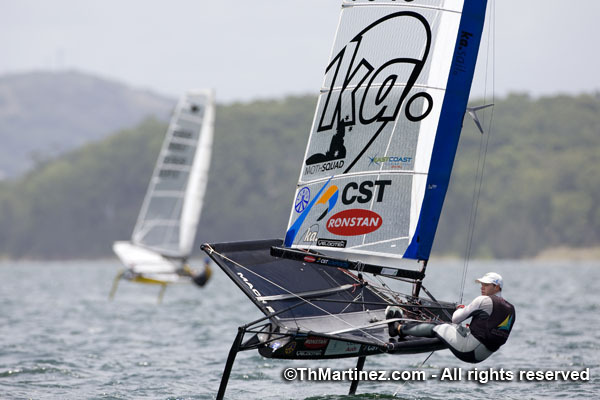 Sailors carry over their rank from the Qualifying Series as points into the 3-day Final Series (e.g. Outteridge starts with 1 point, Burling with 2, etc) starting tomorrow. After a lay-day on the 12th, racing will conclude on Friday, 14th of January. Perfect bulls-eyes today for Nathan Outteridge (AUS) who now carries a score of solid bullets after day 3 at the 2011 Zhik Moth World Championships. 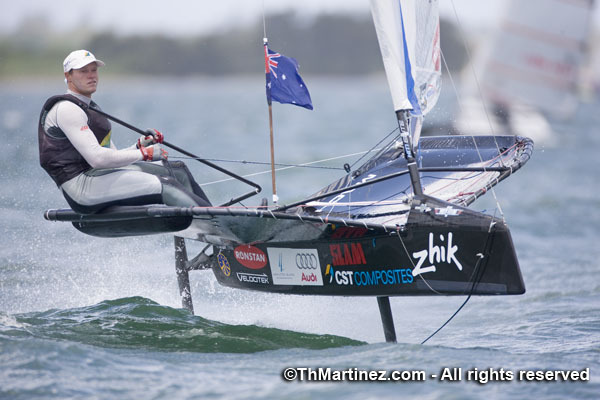 “Keep the nose clean”, advises Josh McKnight (AUS) for surviving the 18-knots gusting over 20 this afternoon in Belmont on the 2nd day of the 2011 Zhik Moth Worlds. The big breeze brought other new faces to the top of the fleet such as Andy Budgen (GBR) in his yellow Lamborghini hull now sitting in 16th over-all (McKnight, 20th), and Japanese Olympian Tatsuya Wakinaga whose great endurance earned him consistent 15th place finishes. 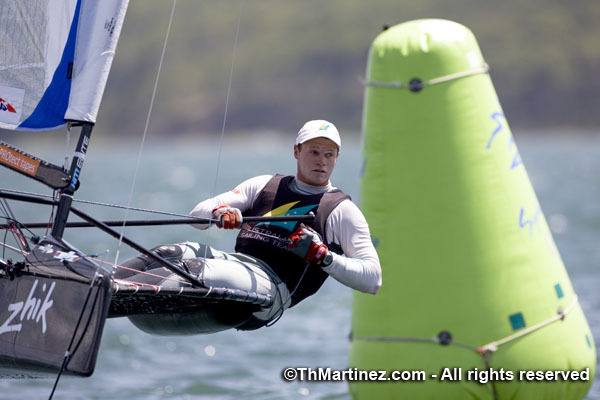 Nathan Outteridge (AUS) and Peter Burling (NZL) begin the cross-Tassie battle for ringleader of the Moth Squad, each firing out 3 bullets and now top the scores in 1st and 2nd place. Scott Babbage (AUS) tussled with Iain Jensen (AUS) throughout the day, Babbage with a quick turn of shame recovered to 4th in the standings overall. 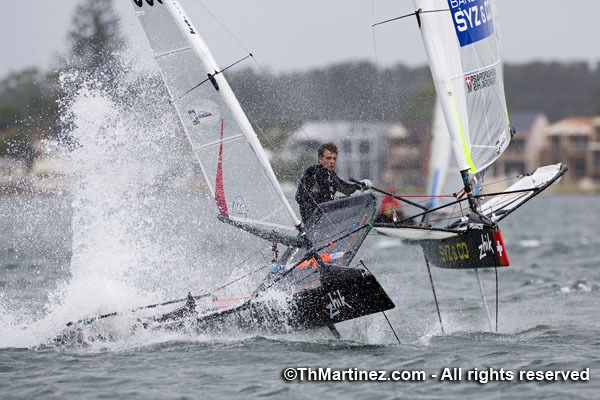 Tom Slingsby (AUS) and John Harris (AUS) take the cake for impressive, and untimely stacks. Slingsby suffered a rocking-horse crash and burn on the downwind track, and after a swim Harris swore, “He would pay Thierry [the photographer] to delete the images”. Both made record recoveries and rest in 7th and 8th, respectively. More damage control down the fleet – Charlie McKee (USA) and the Wing-sail after screaming up the first leg and ultimately landing a 5th place in the first race, had to limp ashore for rig damages, that continued to hold him back for a 21st place in the third. Lost rudders, broken masts and a few tiller issues tested the fleet. 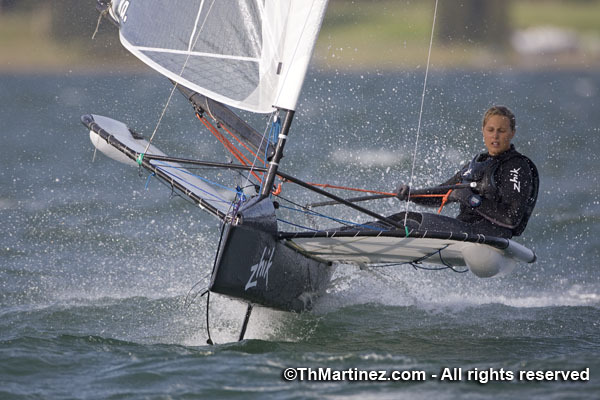 Haylee Outteridge (AUS) sailed in for a brief repair during race 2 but was back out to finish the day. Phones at the Race Office were abuzz with amazed local residents who wanted to know what was happening – one who collected a ship-wrecked Phil Stevenson (AUS) on the lee shore of the track. Brad Funk thanked the US pit crew (and Wing-sail engineer) Rob Patterson (CAN) for servicing those in need out on the course. Crash and Burn - isn't this why we love it? The females of the fleet rocked the breeze, and with the slew of DNFs in the afternoon races, 4 ladies still raced all 3. 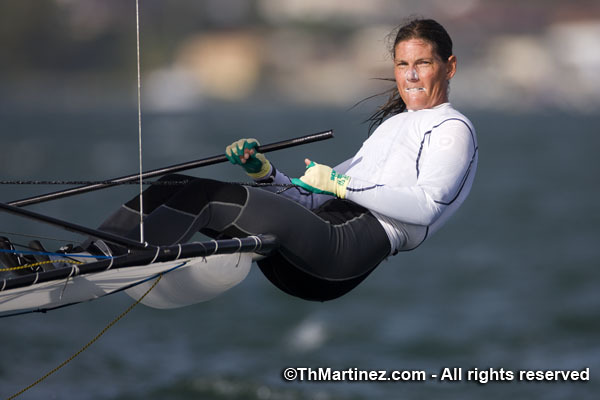 Samantha England (AUS), Lindsay Bergan (USA) and Emma Aspington (SWE) finish day 2 in the top half of the fleet. More than a few sailors might agree as they prep their boats for tomorrow, and the promise of more breeze. The Zhik Team grab five minutes of Simon Payne’s time to chat about the state of play. The Zhik 2011 World Moth TV crew catch up with event organiser, Scott Babbage, a day before the event kicks off. 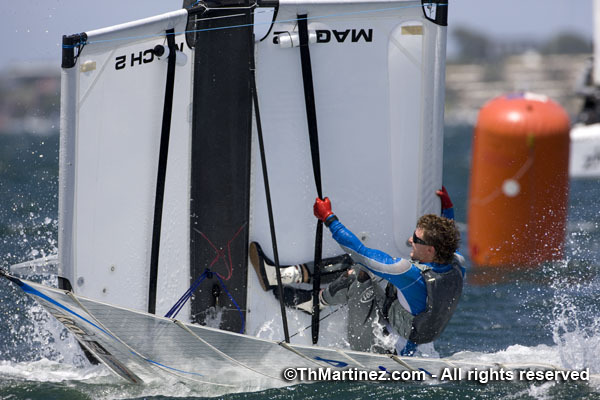 Charlie McKee (USA) rocks the Wing-sail upwind. 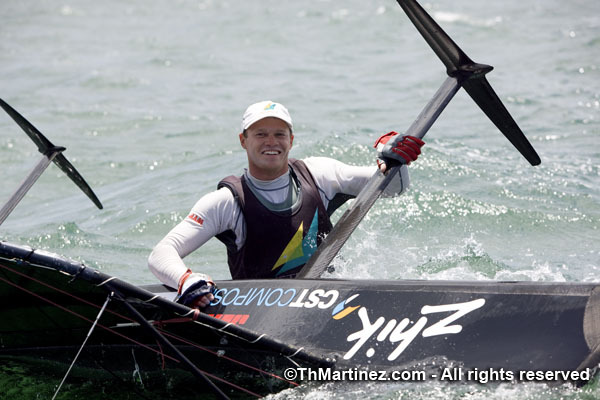 It was a hot first day for the 2011 Zhik Moth Worlds with enough Easterly for “Light-air Flyer” Joe Turner (AUS) to turn out a record of 2, 1, 1 and win the day. Aussies make up 4 out of the top 5 after day 1 with Nathan Outteridge in 2nd, Rob Gough with 3rd, and Scott Babbage in 5th. Kiwi Peter Burling cracks in with 4th. But it wasn’t just the “young blokes” leading around the track, there was plenty of – experience – and international flavour breaching the top 10 around the tracks. Swiss cousins Mikis and Arnaud Psarofaghis (try saying that 10 times fast), both had excellent days, Arnaud pumping out 3 top 10 finishes and Mikis a few in the top 15. Hero moves of the day go to Nathan Outteridge and Bora Gulari who in the last race were dead off the line, rounded the windward mark in 20th and 21st, and both fought their way back to a top 10 finish. “So this is what it feels like to fly” reports Charlie McKee (USA), the Wing-sail guinea pig. The Wing-sail made a stunning debut after having a tough time at the Nationals and a full-blown smash-up during a practice session on the lay-day. “I’ve never piloted a glider,“ McKee said, “But this is what I imagine how it would feel.” McKee had an excellent beat, winning the first leg of the 2nd race and managed to hold on to a 5th. Some of the followers on Facebook couldn’t believe the live updates: “Old Man Rast beat the young guns?” Sailors all born before 19__, such as Chris Rast (USA), Charlie McKee (USA), Peder Arvefors (SWE) and 3rd over-all Rob Gough all tasted the top 10. 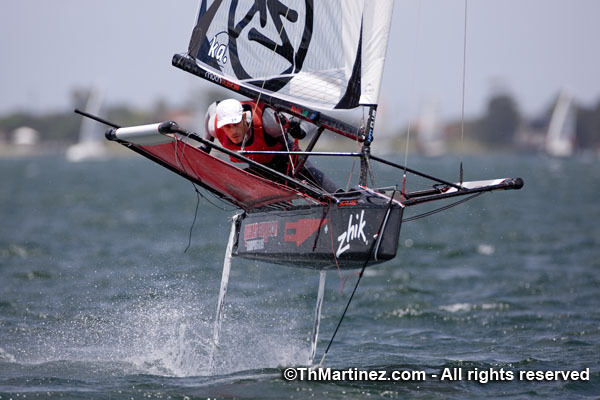 Arvefors, like Rast and McKee, came to the Moth from a strong background in 49ers, as well as some i14s and ice sailing. He’s here with his wife and four kids, “and I think there’s a few cousins too”, proving that you can foil, get top 10 finishes, and have your family, too. He currently sits in 27th overall. A day out from the event, Scott Babbage prepares for the World Championships. 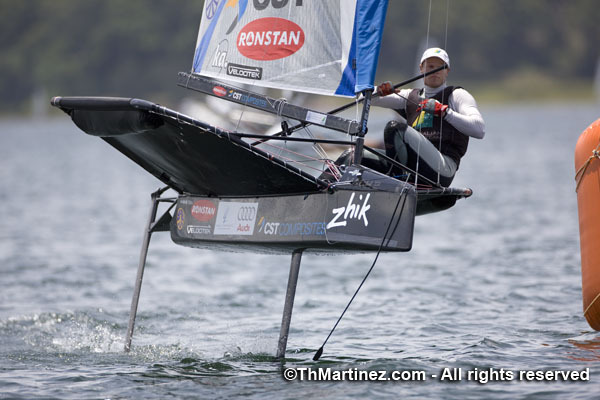 Zhik 2011 Moth Worlds- Moth Talk. Mark Heeley scouts the boatpark at Belmont, and gathers opinion on winged sails. Are they good, bad, or other? 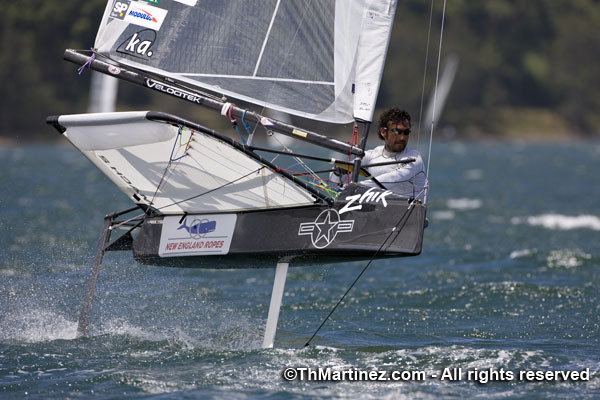 Weed, generals, black flags and a few busts plagued the fleet, but none of it phased Nathan Outteridge who flew into his 5th consecutive win, snapping the title of 2011 Zhik Moth Australian Champion. After thanking his sponsors, Outteridge added a special shout to the “Moth Squad”, a group of Aussie mates that get out and train hard. 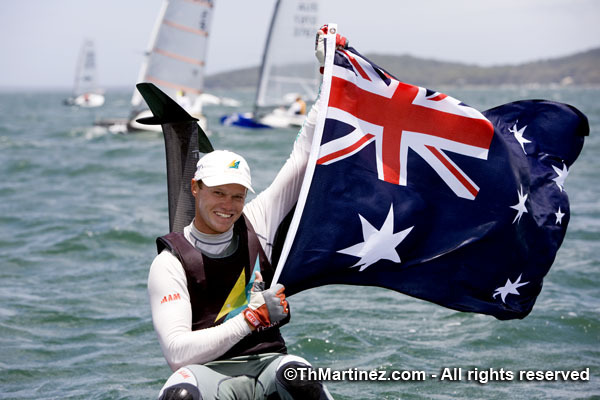 Samantha England (AUS) was first female at 34th, and 15 year-old Jack Sherring (AUS) won first youth at 31st. Outteridge dominated the day by playing the favoured left side and finishing with a comfortable lead over the rest of the fleet. Scott Babbage never gave anyone a chance for 2nd with his consistent scores, and Joe Turner, after dropping a DNF was able to keep only top 10 finishes for a 3rd place overall. 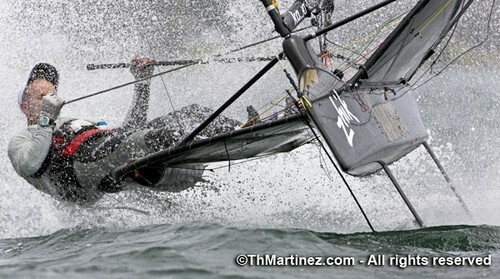 A busted mast slowed Tom Slingsby in race 4, and when back on the course for race 5 – black flag. Ever quick, he finished the day back on his feet with a 3rd. Brad Funk earned most improved, nailing 3 hot races, and was the only non- “Moth Squad” member to penetrate the top 5 of the final race. 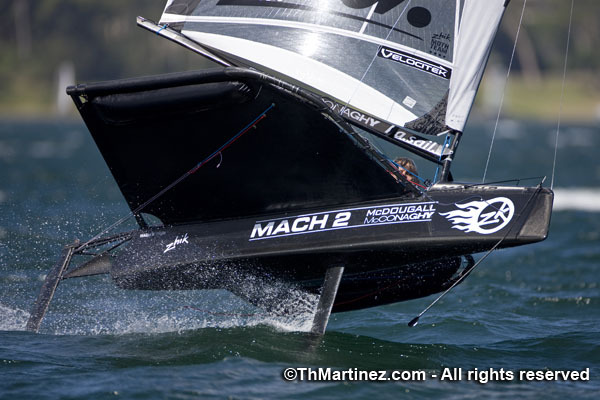 Famed designer of the Mach 2 model Andrew McDougall laughed at his scores, “I can’t f__’n start, and I can’t f__’n tack, but I’m f__’n fast!” The man doesn’t lie, in the 5th race he overtook 5 boats on the final run for a 4th place finish. 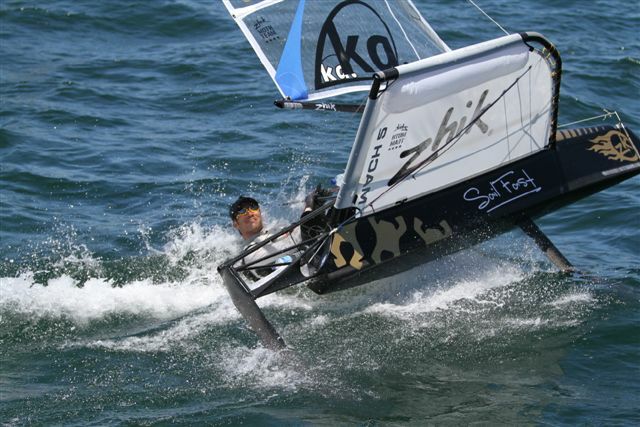 Sailors take a lay-day to prepare for the 2011 Zhik Moth World Championships to begin this Saturday, 8 January. 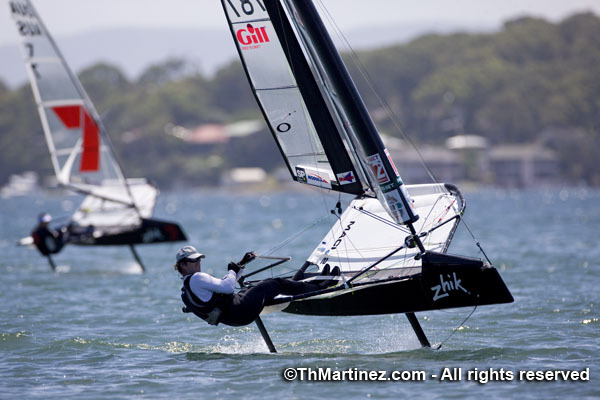 Sailing Instructions for the Zhik 2011 Moth Worlds & Australian Championships are now available. 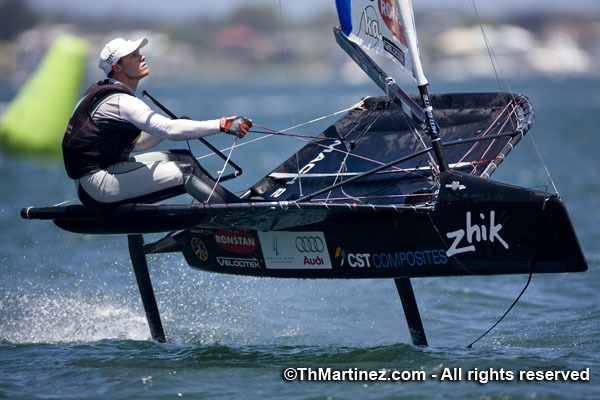 Flymount is partnering with the Zhik 2011 Moth Worlds to give us a unique view of the action on the water. The Flymount is the ultimate camera mount for extreme sports and action photography. The Flymount allows you to capture amazing footage from a different perspective by securely attaching to your equipment. Its compact size and low weight means that it can be clamped on and forgotten about until the end of your session. With its unique cradle mount protecting your camera from unwinding under shock, the Flymount is the safest and most robust choice on the market. Detailed shipping information has been made available by our event partner Associated Customs & Forwarding. Visit the shipping page to find out more. A bulk arrangement to transport boats from the ACF warehouse in Sydney to Belmont is in progress. More information will be available closer to the event. With the assistance of Logan Group Insurance Brokers, third-party coverage is available for International and Australian competitors for the 2011 Worlds. 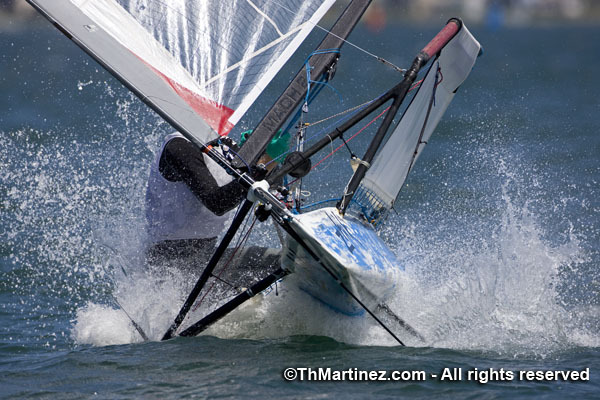 More information on the optional coverage is available on the Insurance page on the Moth Worlds 2011 web site. 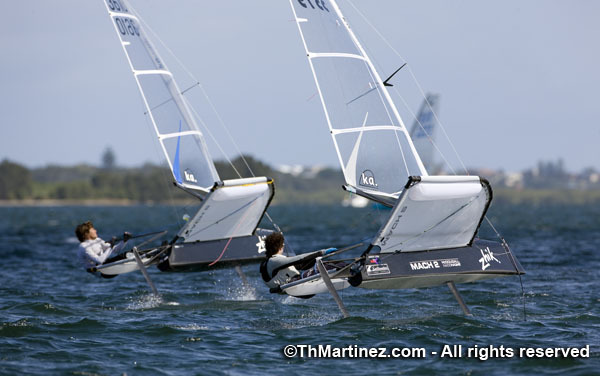 The Belmont calender has been set and we have the dates for the 2011 Moth Worlds. We will have a 2 or 3 day, 6 race Nationals (pre worlds for visitors in conjunction) beginning on Wednesday 5th January, followed by a 10 or 12 race Worlds from Saturday 8th up to Friday 14th. For those keen to have a trial run on Belmont Bay, we will also be holding the 2010 New South Wales Moth Championship over Easter, Friday April 2nd to Sunday 4th. Warm up for the Worlds. The Australian mothies will get a warm up regatta at Belmont. The Belmont 16s have just agreed to run the 2010 NSW State championship overthe usual Easter weekend. We are on. The International Moth Class Association Meeting in Weymouth this week acceped our offer and the Belmont January 2011 World Moth Championship is a goer. They also confirmed Cascade Gorge USA for August 2009 and Dubai for April 2010. That seems to be packing the events up close but with almost 100 moths from 19 countries waiting in Weymouth for sailable winds the future of the class has never looked better. If the grouth rate continues we may see 150 boats by 2011! We are now seeking people or companies who wish to get involved. I am sure together we can make it an event to remember. The A Cats are going to Belmont next January. There is a lot of info about the place on their website here http://www.a-catworlds2009.org.au including an accommodation listing. 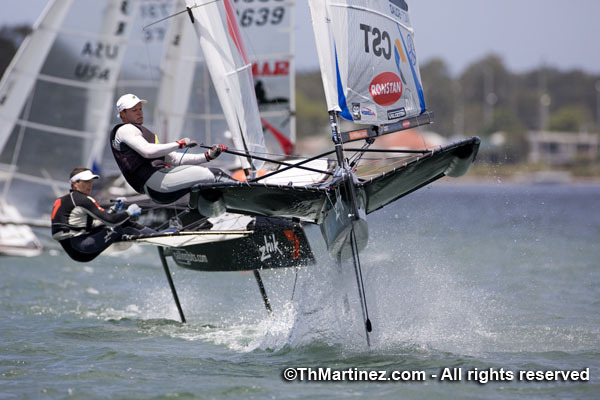 The Moth class Worlds were last in NSW and on Lake macquarie in 1995. 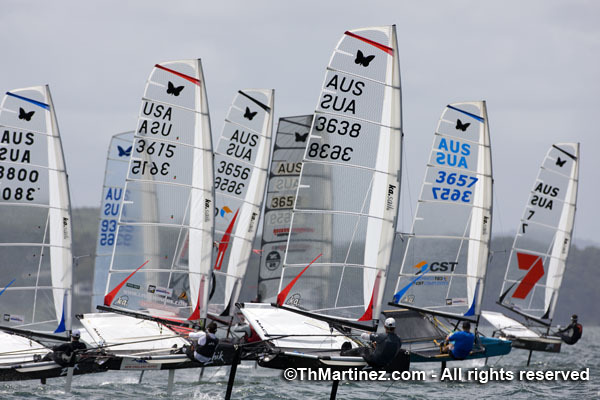 That event at South Lake Macquarie ASC was a great success with about 95 entries from UK, Japan, NZ and Aust, That was a time when T foil rudders and Pocket Luff sails were the hit, and the regatta was won by Emmett Lazich. The phenomenal growth in the class internationally in recent years indicates that the next few years will see a steady increase in numbers of sailors and countries involved in Mothing, and consequently we feel that by 2011 the numbers at Belmont may exceed those at SLMASC in 1995. The Belmont club offers some of the best dinghy sailing facilities in the country and Belmont Bay is one of the classic sailing locations. 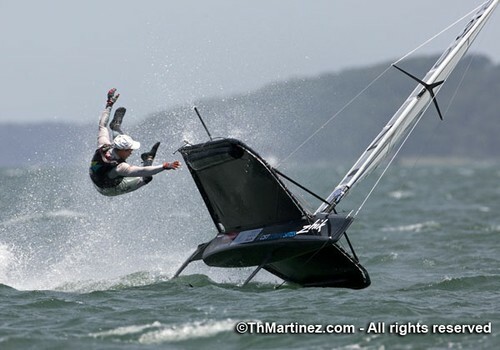 This year’s worlds are at Weymouth UK in July, there is interest in going to Japan or USA in August/September 2009. We need to have an 18 month gap to match northern hemisphere and southern hemisphere summers, hence our January 2011 proposal. We hope to secure the committement of the world’s moth sailors in July, then work to securing sponsors and comitments to allow us to organise an exceptional event. 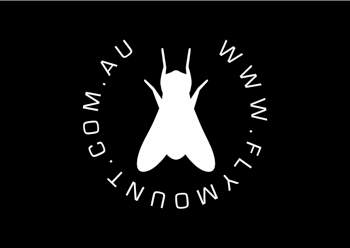 NSW International Moth Association has applied through IMCA Aust to run a World Champs in January 2011. This application will be considered by IMCA at the 2008 AGM to be held at the WC in Weymouth UK next July. 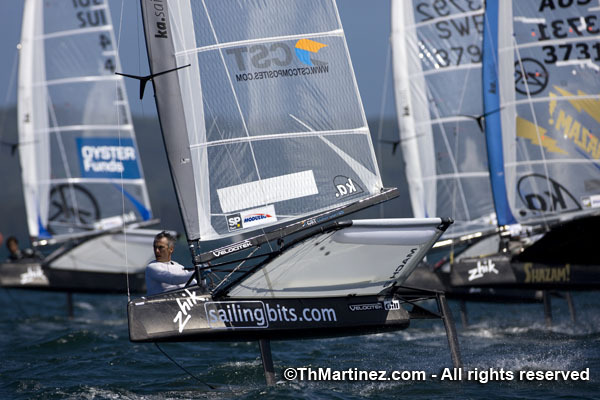 This site will be a temporary source of information for Moth sailors and others who might be considering their position in the moth sailing world over the next few years. We will post info about the proposed venue, links to other Moth information and hopefully generate great interest inthe Class, the event and attract new sailors and sponsors to the class.